My guide to Kuta Bali for everything you need to Know about Kuta Beach, including the best places to stay, eat, visit and have fun. Kuta is located on the west coast of Bali and is approximately 5km long with full beach front access, before turning into Legian. Kuta is known for its learn to surf classes, beach side massages, bargain shopping, night life and offers a wide range of accommodation, shopping and restaurant choices. 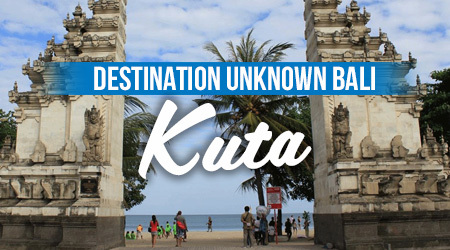 Kuta is a Famous tourist area and is known for its party atmosphere with young tourists and backpackers, After dark, visit one of kutas many bars and clubs and dance away until dawn, but Kuta can offer alot more than than. South Kuta officially known as Tuban (between the airport and Discovery Shopping mall) is slightly further away from the hustle and bustle of Central Kuta but still close enough to enjoy all the action Kuta has to offer. South Kuta offers a much more peaceful, laid back alternative to Kuta, with less crowded beaches, calmer water and more family’s tend to holiday here. Be sure to catch the legendary sunsets and the Balinese ceremonies on the beach.